Teluk Bahang is a busy fishing village in the northwest corner of Penang. There is a jetty and a shallow inlet where small fishing boats are moored. The village was originally a strip of wooden houses along the beach front but has since expanded inland. A few blocks of low cost housing have been added. These were painted gleaming white when I first visited this bay in 1995 but now in 2011 they look shabby and weather stained. Being only 5km from Batu Feringgi and located on the main road which circumnavigates the island of Penang, the village is a popular stopping off place for visitors looking for seafood or wishing to access nearby Penang National Park. There are a few simple restaurants here including Fishing Village Restaurant which has received favourable reviews. There is a long sandy beach in this bay where fisherwomen can be seen scraping the surface to look for shellfish. The beach is suitable for walks or sunbathing but the sea is not very clean for swimming as sewage from the village is said to discharge here and also there can be lots of jellyfish. 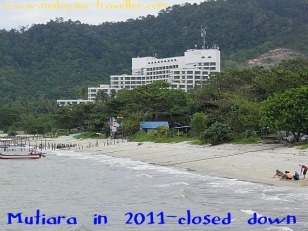 There used to be an upmarket hotel on this beach, the Mutiara Beach Resort. I stayed there in 1995 when it was still quite new. Even then I don't recall swimming in the sea but the hotel had a nice swimming pool so we did not miss the sea too much. When I passed the hotel building recently in December 2011 it was boarded up and appeared to have been closed down for several years. I wondered whether the hotel had been damaged in the tragic 26 December 2004 tsunami which affected this part of Penang but my research tells me that the hotel was only slightly impacted. I guess it must have closed down for other reasons and its future looks uncertain. Seems a shameful waste! Penang National Park. The entrance to this park is in the village itself. In addition to the usual rainforest trails, the park boasts some unspoilt beaches such as Monkey Beach and Kerachut Beach which can only be accessed on foot or by boat. Penang Butterfly Farm. I visited this park way back in 1995 and remember having an enjoyable time but I admit we did not go back on my recent visit as we have been to similar butterfly parks in KL and Cameron Highlands not so long ago and my kids are all 'butterflyed-out' for the time being. Tropical Spice Garden. This is one of the top attractions on the Penang tourist trail and of particular interest to first time visitors to a tropical country who may not have seen exotic spice plants before. Teluk Bahang Dam. This dam and reservoir is located close to the National Park and enjoys scenic surroundings. The Penang International Dragon Boat Festival is staged here annually. In 2012 it will be held from 30th June to 1st July.